Kettering Town held their nerve to win the NFA Hillier Senior Cup in a thrilling penalty shoot-out as they edged out Corby Town after 1-1 draw at Sixfields. Jason Lee fired the Steelmen in front in the second half before Aaron O’Connor levelled late on for Kettering. And it was the Poppies who triumphed 7-6 in the eventful shoot-out that followed. New Corby boss Steve Kinniburgh, as he said he would, named a strong side although there was no place for central defender Aaron Brown in the Corby squad with Jamie Anton given the nod. The Poppies, meanwhile, named an unchanged side following the 3-0 victory over Slough at the weekend. There were few chances in a poor first half, although Kettering went close when Nathan Hicks’ volley was deflected just wide and then Dominic Langdon flicked a header off target. But it was the Steelmen, who worked hard under their new leadership, who created the best chance when Connor Kennedy curled over the bar from a good position. The game sparked into life when Corby took the lead in stunning fashion on 65 minutes when former Poppies defender Jason Lee hammered home a volley from 25 yards. 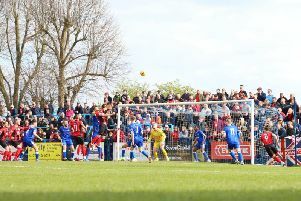 But Kettering grew back into the game and, after Kennedy had cleared Rene Howe’s effort off the line, the Poppies drew level. Howe won the ball ahead of Aidan Grant and his shot was rolling towards goal where Aaron O’Connor applied the final touch. With the scores level, it was straight to penalties with Howe and Danny Draper both having efforts saved in the regulation five spot-kicks. In sudden death, it was Lee who missed the crucial kick as he shot high and wide and that left James Brighton with the chance to step up and win it for the Poppies. AFC Rushden & Diamonds’ play-off hopes in the Evo-Stik Northern Premier League Division One South suffered a blow as they were beaten 2-0 by fellow contenders Stocksbridge Park Steels at the Dog & Duck. Diamonds were without influential defender Liam Dolman who suffered a calf injury during the 1-0 win at Leek Town at the weekend. And the home side suffered in the opening half as they fell behind on 16 minutes when Matthew Reay flicked home a header from a corner. It got even worse for Diamonds 11 minutes when Harrison Biggins’ long-range free-kick beat Matt Finlay and found the bottom corner. Finlay saved well from Brodie Litchfield before the break while Ben Ford tested David Reay with a thunderous effort early in the second half. Nabil Shariff was also denied by David Reay and then went close with a backheel. But they were unable to find a goal as Stocksbridge saw the game out.